1825: 31 December, born Lynn Regis, Norfolk. Father: John. Mother: Frances (1). 1826: 26 May, baptised St Margaret’s Wesleyan Church, Lynn Regis (1). 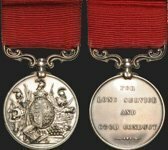 1847: c. June attested Royal Sappers and Miners (2). 1849: 30 May, married Ellen WHITMORE at Holy Trinity Church, Old Brompton (3, 4). 1851: Residing at New Road, Woolwich, Kent with wife Ellen. Rank or occupation Royal Sappers & Miners (5). 1851: 18 December arrived Fremantle on Anna Robertson 20th Company RSM. Trade recorded as ‘smith’ (6). 1850-1855: James and Ellen had three children. One child (name unknown) was born in England in 1850 or 1851 at sea on the voyage to Australia. Susan 10 Oct 1853, Albany, Western Australia. Eliza 24 Oct 1855 Albany, Western Australia (7). 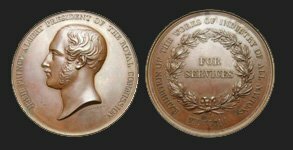 1853-1855: Stationed at the Convict Dept at King George’s Sound (Albany) in August 1853 to December 1855, where in September 1854 he was promoted to Corporal (8). 1856: Recorded as sick from June for the remainder of the year and hospitalised in August (9). 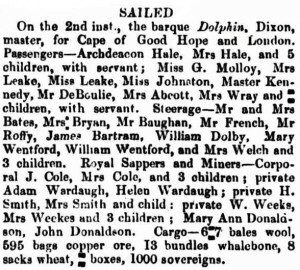 1857: 2 March James and Ellen Cole and their three children left for England on Dolphin (10). And that is where we “lose” James Cole and his family. Exhaustive searches of census records after 1857 have not been able to identify James, Ellen or his two daughters (11). It is possible that James returned to England as a very sick man – he had, after all, been recorded as sick and hospitalised in the ten months leading up to his departure. Perhaps he died and Ellen remarried, her second husband giving his name to the children. 1. Non-Conformist Registers, National Archives, Kew [RG4-649]. 2. Return of 20th Company in Western Australia 5 Feb 1855 [WO1-437-219]. 3. Marriage Locator, Guild of One Name Study. 4. 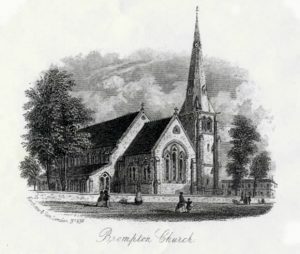 Medway City Archives, P153D Old Brompton 1848-1855. 5. 1851 Census of England & Wales [HO107-1589-393-10]. 6. Muster Rolls & Pay Lists Sep – Dec 1851 [WO11-126]. 7. Family Search [GS Utah Film No. 284850]. 8. Muster Rolls & Pay Lists 1853 – 1855 [WO11-138, 142]. 9. Muster Rolls & Pay Lists 1856 [WO11-152]. 10. 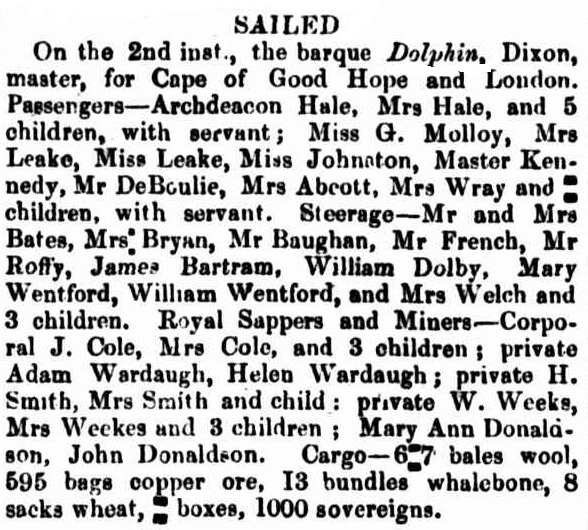 Perth Gazette 6 Mar 1857. 11. 1861 & 1871 Census of England & Wales.